Wanting to be a good steward of my own land, to improve it and put it to use. 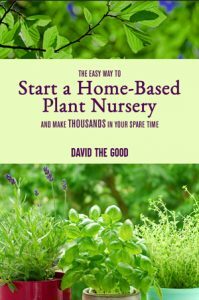 These thoughts got me interested in alternative ways of producing food, which led me to permaculture and home-grown food. I really liked the idea of permaculture and food forest garden designs. When I finally committed to starting an edible garden, I wanted it to be a food forest. The main aim of my first garden was to test my own commitment and to (hopefully) show my wife that it wouldn’t ruin our backyard. To do this, it needed to be small and reversible. I wanted to use layers of plants, mostly perennial, with a mixture of edibles and beneficials. Herbicides and pesticides were not to be used. 4th of June, 2018. The Moringa, Mandarin, Acerola and Agave (it had to go somewhere) among the Cow Peas. The trees were planted in early May. The mulch is Palm fronds, Mango leaves and Lilly Pilly prunings. The city has imposed severe water restrictions. Looking back over my first year, my commitment to growing food has remained strong. I have had some successes and I have enjoyed it more than I expected. My original motivations remain, though my eagerness to develop a mini food forest and focus on perennials has diminished, a bit. With the small amount of land I am working with, I now think it is necessary to include some other gardening methods as well to make the most of the space. Herbicides and pesticides? I resisted poisoning the aphids on my beans and the leaf miners that attacked my Mandarin tree and I’ve used only mechanical means (squishing) to combat the grasshoppers that eat my Sweet Potato plants. But, this very night that I’m writing these words, I used Pest Oil to defend my Chilli bush from the White Fly that were sapping its strength just as production is peaking. I’ll find a way to justify that to myself. 22nd of February, 2019. Some plants are suffering in the summer heat. It was 40C the day before this photo was taken. 3 weeks ago there was a major flood, yet water restrictions remain. The climate here is coastal, dry tropical. There is a lot of rainfall but it is mostly in the summer, leaving the rest of the year sunny. Annual evaporation is more than twice the annual rainfall. I’ve tried to select plants with this in mind. Acerola Cherry Fast growing and tough. No fruit yet. I chop and drop it to control the size. It would be good to plant it with a sturdy, permanent stake to support it. Bought from a nursery that grew it from a cutting. Chilli (Bishops Crown) Lots of tasty, relatively mild fruit. This was bought online as tubestock. Cow Pea This was the first thing I planted. Improving the soil was the goal. Some pods were allowed to develop so now they come randomly around the garden. These seeds were bought online. Eggplant (Golden) This grew well and produced fruit but it is small, has a lot of seed and the skin is tough. Not great qualities for eating. In future, I will try growing a more regular variety. Garlic Chive These have sprouted and grown well but have found my ‘food forest’ to be a bit rough for them. Many of them died. I would like to try these again in a more appropriate spot. Greater Yam Early days. It is growing very well in a small mound next to a clump of Macarthur Palms which I am training it to climb. The plan is to propagate from this plant. It was bought online as tubestock. Katuk (Sweetleaf) I have just planted this in a no dig garden bed in partial shade. Lemon Grass Fast growing and tough. Sun, shade, wet or dry, it doesn’t mind. I have used this as chop and drop to keep it under control but haven’t cooked with it yet. These were bought as seeds from a hardware store. Mandarin (Hickson) A slow and steady grower that has handled the wet, dry, heat and pests well. No fruit yet. This is a grafted tree that came from a local nursery. Mexican Coriander Very slow to germinate. It has struggled along and is not as easy to use or as nice to eat as regular coriander leaf. The seeds were bought online. Moringa Oleifera Very fast growing and tough. Extremely fast when it’s wet and a bit slower in the dry. I chop and drop it to control its size. It would be huge otherwise. Although it probably would have blown over. This was bought from a backyard nursery as a seedling. Mushroom Plant This doesn’t seem to do well in full sun where it needs a lot of water and produces a less palatable leaf. It grows from cuttings easily. This plant was bought from a hardware store. Snake Bean Mixed results with these. I planted them late so they struggled with the heat and humidity of summer. The fruit was good so I will plant these again. Seeds were bought at a hardware store. Sweet Potato (2 types, white flesh) These are tough and fast growing. No edible roots yet though. One variety I got as cuttings from another garden and another from a store-bought potato. Thai Basil An attractive plant and a tasty herb. These have grown well. Occasional pruning required to keep them under control. Tomato (Thai Pink Egg) Mixed results with these. I planted them late so they struggled with the heat and humidity of summer. The monsoonal rain was the end of most of them. The fruit was good so I will plant them again. The seeds were bought from a hardware store. Welsh Onion (Nebuka) As with the garlic chive, I need a better place to grow these. Seeds were bought online. Winged Bean My first try of these was a failure. The plants that came up didn’t look right and never really got going. I have bought new seeds online and am trying again. Cucamelon This grew well but did not yield well. I gave up on it and cut it out. Four have come up in its place. Pineapples As you would expect. Tough, slow to produce and delicious. These were all propagated from heads and pups. Some of the things listed here really were dumb. Others were just things that could have been better or deliberate experiments that didn’t go well. All part of the learning process. Building a garden in a location that compromised the drainage of my backyard. It was a swamp when the monsoon came. Planting an Acerola and a Moringa in deeply loosened ground. Once they got some size (which didn’t take long) the wind blew them over. Fortunately they both survived. Digging some manure and mulch into the hard clay that is my soil, topping it with mulch and thinking I had fixed it. It’s now back to being hard clay, though it does have nice mulch on it. Under-watering during the dry season. Just because the mulch layer is wet doesn’t mean the soil underneath is wet. Sorry to those plants that didn’t make it. Planting Sweet Potato around a tiny Moringa tree thinking they would get plenty of sun. 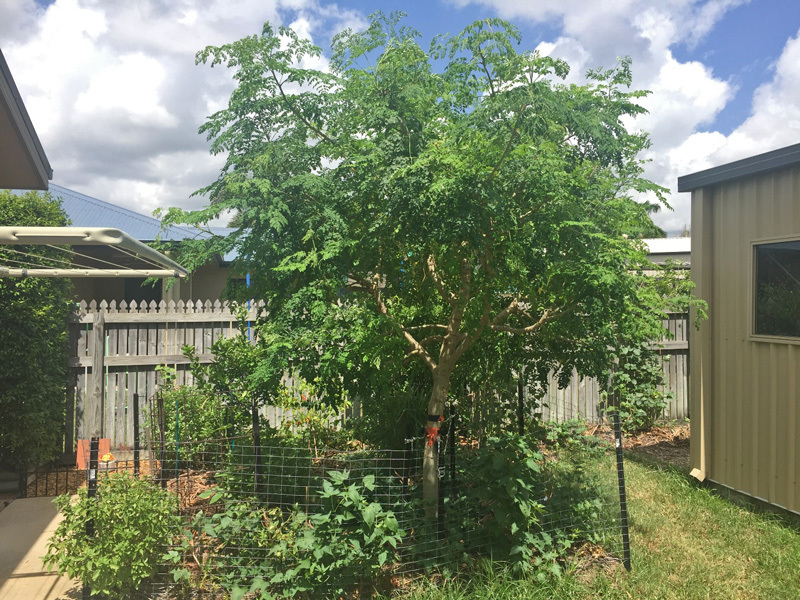 The Moringa grew like a crazy and put the Sweet Potato in the shade. The Moringa would have grown 6 metres in the first year were it not for some heavy pruning. Planting delicate plants in our blazing hot sun. If the instructions say ‘partial shade to full sun’, I need to err on the side of partial shade in this climate. 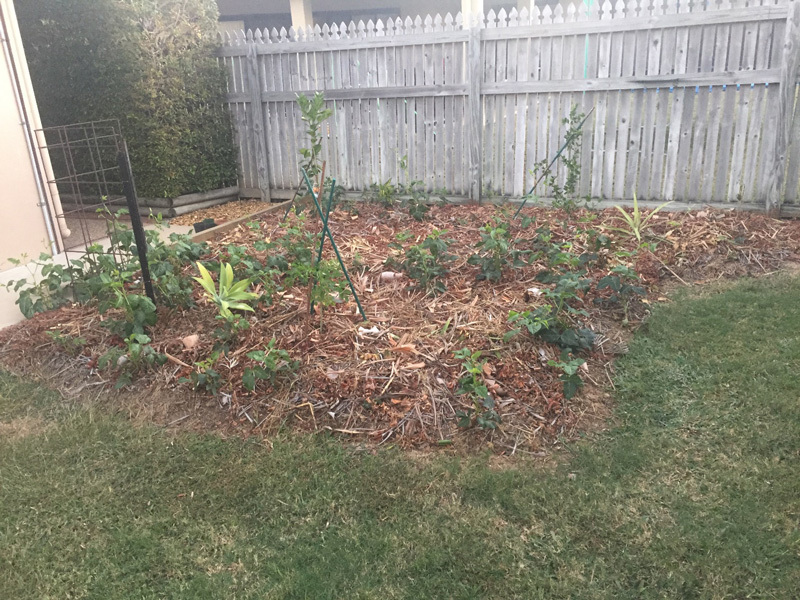 I tried to be too ‘permaculturalist’ in my small trial garden and misused some concepts. I’m not unhappy with it but a few beans and herbs around some fruit trees doesn’t give me much to eat. Also, not all plants I’m growing are happy in a chop-and-drop garden. Not enough local input. For reasons possibly relating to ignorance and pride, I didn’t talk to many local gardeners before I started. Obviously, this was a mistake. Trying to grow tomatoes and beans in summer. Some survived, some even fruited. It wasn’t really worth it though. Planting too soon (I think) after working the soil and digging in manure and mulch. Plants struggled in the first month or so. Some died. Mistaking a weed for a Thai Basil and feeding it to my wife. Growing things I hadn’t tasted – then finding I didn’t like them. It’s okay if not much has been invested. Planting fragile herbs in a chop and drop garden. Garlic Chives don’t like having a palm frond dropped on them. There have been a number of things I’ve done that I think, at this stage, are good. Maybe with more knowledge and experience I’ll change my mind on some of them, but for now, these are my successes. Having a go at growing food. It’s fun. Eating food I grew myself. Having a section of garden that can handle chop and drop. So easy to look after. Getting soil tested. I would never have thought that I needed copper or boron. Reading and listening to other people. There is so much to be learnt and it doesn’t all have to be the hard way. Not always listening to other people. It’s fun to experiment. Finding people who grow things in the same climate as me, in different countries and seeing what works for them. I’ve found lots of plants I’d never heard of. Then often found local people who are in the know are already growing them. Finding a use for all my green waste. 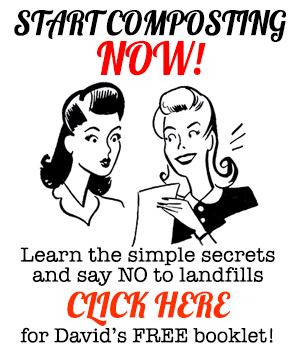 By composting, mulching and cutting firewood, I don’t have to dump any. Having a go at no dig gardening. It has made some good soil with very little work. Especially when compared to the first garden I did. Writing a year in review. It has been good to think back over the first year and write down some of the things I’ve done and learnt. These are things that are in progress or on my radar. Everything in this list is achievable. There are other half-baked ideas that aren’t on paper. Grow some small trees that can be coppiced for firewood. Get a rocket stove and learn to use it at home, then take it on camping trips. My Ecozoom is on order. Grow some bananas. I am preparing some ground but haven’t decided on a variety yet. I’ve only eaten Cavendish, Lady Finger and Sugar Bananas. Of those, Cavendish is my favourite. Grow and propagate from my one yam plant and one Katuk plant that I received in the mail recently. Fix the drainage in my backyard, without making the water run off to the street too fast. Grow some winged beans. I hope they’re good. I don’t know anyone who’s growing them so I haven’t tasted them. Set up an area more suitable for growing herbs. Get better at cooking with what I grow. 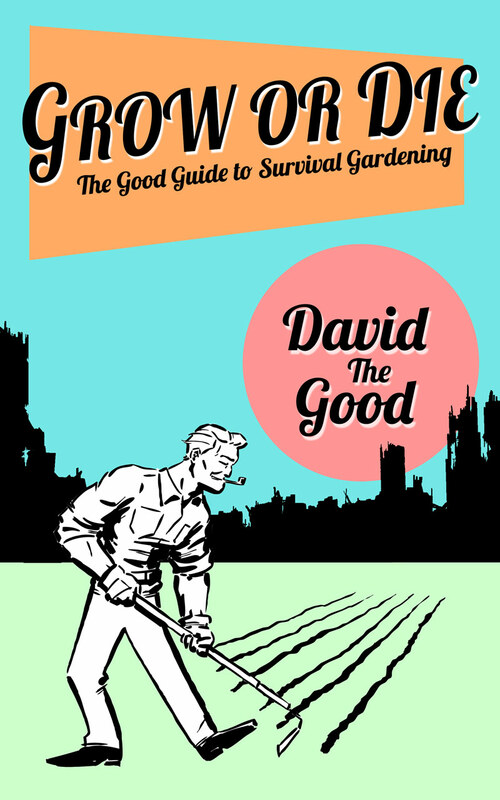 Talk to people with enthusiasm about growing their own food without coming across like I think I know it all. That’s a difficult balance. I want to encourage people but I don’t have much knowledge or experience with which to advise them. Where to now? I’m ready to call my trial garden a success but, other than the list above, I haven’t figured out what to do next. Will there be more garden beds? More fruit trees? I hope so, but I’m not sure what or where yet.